The 9 Best Candy Shops in Maryland! If you are ready for a sweet treat you can head to the grocery store, but why would you? With some incredible candy stores in Maryland, you will have far more fun visiting a mom and pop shop that crafts sweets by hand or offers something truly unique. Regardless of where you live in the state, you can satisfy your sweet tooth and have an incredible time doing so! Here are our favorite candy shops to get your started. They have been serving Baltimore since 1917 and are such a well-known local favorite that people will order their holiday sweets weeks ahead of time. Place your order for Easter, Christmas, etc. and know that you better buy double because everyone who comes over will be gaga for these classic sweets and chocolates. There is nothing like them. If you have moved out of the area, they will ship to you which may just save your holiday! For handcrafted sweets that are as beautiful as they are delicious, head to Main Street Sweets. A lot of what they serve is seasonal so even locals wait for their favorites sweets to come out year after year. The truffles are to die for. Do you remember your favorite chocolate bar or candy from your childhood? Whether you are 30 or 70, they probably have it. The variety is huge and they carry candy that you cannot find anywhere else. Bring mom, grandma, and the kids because everyone will be in candy heaven. Handcrafted sweets, local favorites, and a huge variety make this a candy store that everyone can appreciate. This is where you go to find Kosher candy and chocolate, sugar-free chocolates, fruits and nuts, etc. In other words, if you have a unique dietary need or know someone who does, you can still find a tasty treat by heading to Baltimore. This family-owned business started as a small vendor at local markets and has become so popular that they have moved twice to accommodate their growth. When you visit Sweet Dreams Candy Shoppe you are going to find a combination of old school novelty candy and handcrafted chocolates that melt in your mouth. A lot of what they do is fun and seasonal so it’s worth visiting several times a year. Come for chocolates, candy and ice cream. 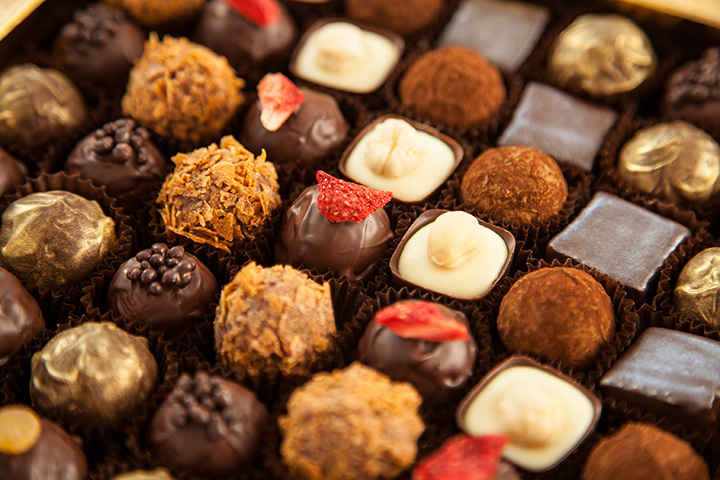 Their gourmet chocolates look and taste divine while being highly unique. When you purchase a box, you are likely to see chocolates that look like they were painted by a true artist using vibrant colors and their imagination. It’s a unique gift that virtually anyone would enjoy. They feature chocolate dipped pretzels, bulk and specialty chocolates and candy, and gourmet products. If looking for Kosher sweets, you can find a large variety here. For example, you can buy a Passover Chocolate Plagues Gift Box here. Yumminess at the beach. Since 1937 beachgoers have been buying homemade taffy, fudge, and sweets from the Candy Kitchen. They have several locations near the beach now but what hasn’t changed is how fantastic their taffy is or how their fudge will become your new family favorite. With so many types of candy to choose from, everyone in your family will want to stop here year after year. They sell a lot of gourmet chocolates and sweets online but their retail shop in Stevensville is where you can go for sweets seven days a week. If you loved camping and roasting marshmallows by an open fire when you were a kid, you have to drop by for their s’mores sweets. Wow, they are beyond incredible and a sophisticated treat for the kid in you to fall in love with. Hey, you might even want to revisit that campfire when you’re done.